Crave Energy Drink is a powdered drink mix that is to be combined with 16 ounces of water to yield two servings per packet. 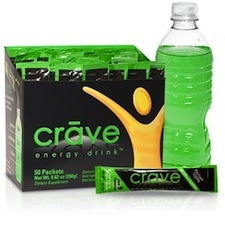 Crave Energy sent me their portable packages containing a drink mix which is to be added to 16 ounces of water. This concept has been around for a while, and I’m always curious to see what energy companies can come up with to pack a kick into a tiny package. Crave has touted these sticks as the ultimate in portable, convenient energy. I have had good and bad energy mixes, so let’s dive right into Crave. I tried Crave in two ways. First, I added the stick to a bottle of water per the directions on the package. The taste was a slightly sour fruit punch flavor and I enjoyed it. The next time I tried it, I simply poured the contents of the package in my mouth (like a Crunk Energy Stick). The flavor was pretty intense, but still not overpowering. If I were to use Crave on a regular basis I would probably use it this way. Crave has two servings per packet. Each serving contains 9 calories, 80mg of Caffeine, 500mg of Taurine, 120mg of Guarana, 50mg of Kolanut Extract, 35mg of Inositol, and 100% of your Daily Values of Vitamins C, B6, B12, Pantothenic Acid, and Niacin. The effect of Crave Energy Drink is similar to your standard Monster or Rockstar. I felt the effects quicker without adding it to water. In either case, the packets gave me a good lift in mood and energy with no real crash at the end. I was more than satisfied with the effect of Crave. I underestimated how good these packets were at first. As far as drink mix packets go, these have excellent flavor with no bitter caffeine aftertaste, a good supply of energy, and are crash-free. I would definitely pick up some of these again. If you are one that misses Power Edge, then Crave will be right up your alley. Check out Crave's website here. How Does Crave Energy Drink Compare? Crave Energy Drink contains 10.00 mgs of caffeine per fluid ounce (33.81mg/100 ml).